I’m really interested in something that I call Personal Metrics – the idea that we can change our behavior and habits through measuring our behavior. Personal tracking is becoming very popular as new technologies and industrial design give way to new methods and devices that can track aspects of our lives. A few months ago, I saw a television commercial for something called Lumosity, which told me that the brain is a muscle and that by working that muscle out, I can improve my brain function. Naturally, I was intrigued because it combined my interested in neuroscience with the whole notion of changing my behavior. Coincidentally I had decided that in 2013 I wanted to try and improve my focus and productivity. I tried the concept of monotasking, but the proposition of training your brain to improve functions in certain areas was quite interesting. For the last 2 months I’ve been doing Lumosity, almost daily. Everyday around lunch time I get a reminder to go to Lumosity and do my daily training. The training consists of playing 3 games which takes about 10 minutes at most. The games are designed to help you improve you brain function in a few key areas: speed, memory, attention, flexibility, and problem solving. Examples of games include word games, math games, and puzzles. Given that I’ve never been much of a game player, either video games or other (board games, cross words, etc) I found the games to be quite fun and easy, it was honestly a nice break during my day! When you first start doing brain training, your first games establish your baseline BPI (Brain Performance Index). When I started mine was around 520 and now two months later, it is at 920. My best two areas are flexibility and speed, which I would have to agree with. There are much more robust analytics available if you pat for the service, as well you can see how you compare to others and I’m guessing your friends. But, so far I haven’t been compelled to pay $14.95 a month to have more data and a wider variety of games. I’m really interested in the idea of how habits are formed and how we can design products that have habits baked into them. 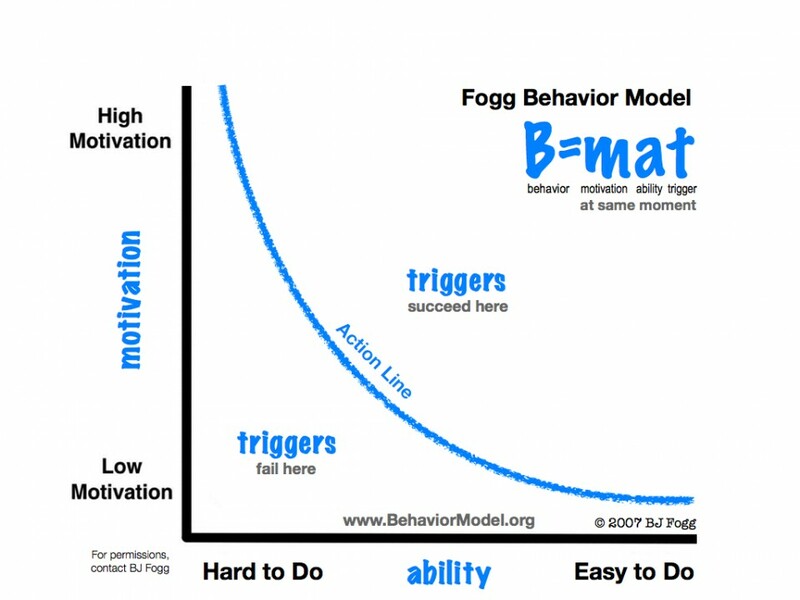 BJ Fogg from Stanford’s Persuasive Technology Lab has done a lot of research on habits and his Behavior Model proposes that in order for behavior to occur, you must have motivation, ability, and a trigger at the same time. BJ Fogg Behavior Model – Used by permission. I think that Lumosity has done a really great job of developing a product that has successfully become a habit in my life. The goal of Lumosity is that they have people come back frequently over time and do the daily brain training. To ensure that behavior occurs, they’ve designed motivation, ability, and trigger into the product quite well. The element of motivation is that I want to see that BPI (Brain Performance Index) number keep increasing. If it decreases, it just makes me feel like I’ve failed, and worse, that my brain is losing any progress it made! The element of ability is that I have a specific expectation of exactly what I need to do, how hard it will be, and how long it will take. I know what’s going to be required of me. And, because I set the trigger (the email notification) to come to me at a certain time and on certain days, I am now at the point where I’m anticipating and looking for that trigger in my inbox. As for my brain? Well, honestly I feel like I am noticing a difference. For example, I have never been that great with names. But now, I seem to be remembering people’s names and faces more. I also feel like my attention is improving, that I can focus on a specific task for longer amounts of time without getting distracted. Of course, this doesn’t address the huge issue that as a society, we’re simply overwhelmed with information and distractions nearly all day every day. It’s doubtful that we could ever develop enough products and services to help manage the volume and flow of information. So instead, I like the idea of focusing on how we can strengthen our brains to more efficiently process all this information and function better in the sometimes chaotic environments that we find ourselves in. Give it a try, Lumosity is free right now. Although you can pay for extra analytics and games if you want.